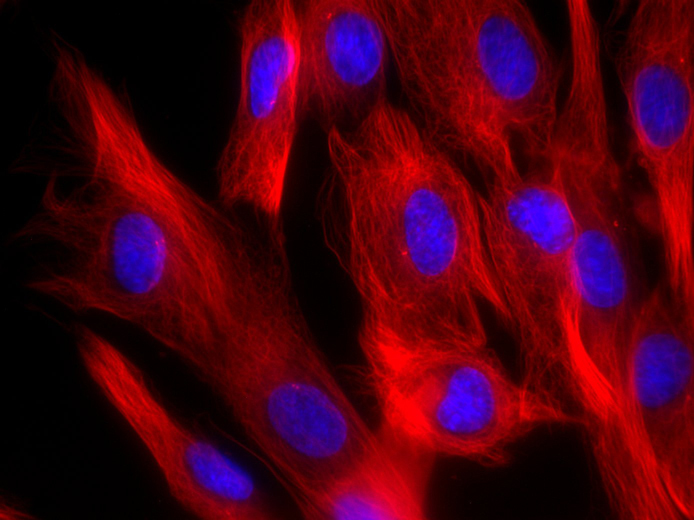 SiR-Tubulin provided by Cytoskeleton, Inc.
Fibroblast cells stained with SiR700-tubulin (red) (Cat. # CY-SC014) and Hoescht (blue). *Based on the following conditions: 0.5 – 1 ml staining solution / staining experiment with 0.5 – 1 µM probe concentration. The number of staining experiments can be further increased by reducing volume or probe concentration. Cytoskeleton, Inc. is the exclusive provider of Spirochrome, Ltd. products in North America. For product Datasheets and MSDSs please click on the PDF links below. 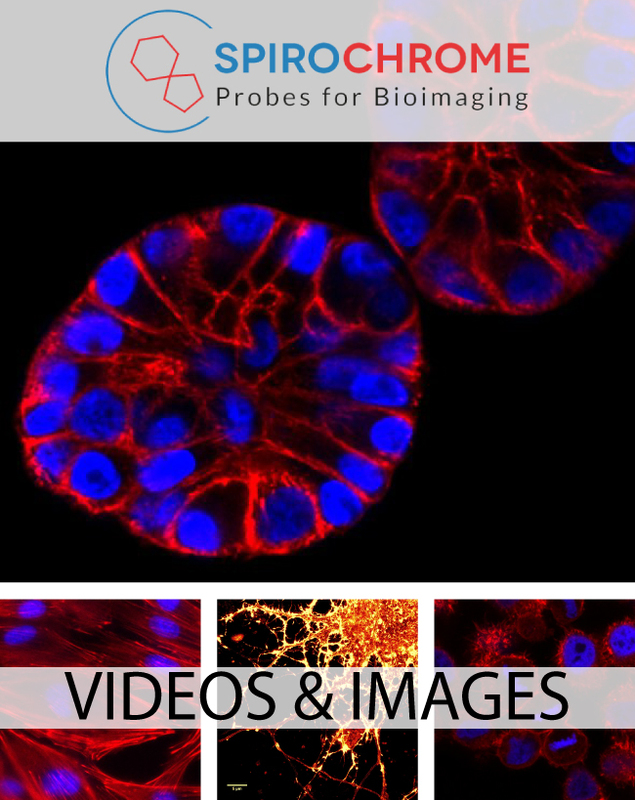 "Fluorogenic probes for multi-color imaging in living cells." Lukinavicius G. et al. 2016. J. Am. Chem. Soc. Doi: 10.1021/jacs.6b04782. “Fluorogenic probes for live-cell imaging of the cytoskeleton”; G. Lukinavičius, L.Reymond, E. D’Este, A. Masharina, F. Göttfert, H. Ta, A. Güther, M. Fournier, S. Rizzo, H. Waldmann, C. Blaukopf, C. Sommer, D. W. Gerlich, H.-D. Arndt, S. W. Hell & K. Johnsson; Nature Methods 11, 731–733, 2014. “STED Nanoscopy Reveals the Ubiquity of Subcortical Cytoskeleton Periodicity in Living Neurons”; E. D’Este, D. Kamin, F. Göttfert, A. El-Hady, S. W. Hell; Cell Reports , Volume 10 , Issue 8 , 1246 – 1251, 2015. “A near-infrared fluorophore for live-cell super-resolution microscopy of cellular proteins”; G. Lukinavičius, K. Umezawa, N. Olivier, A. Honigmann, G. Yang, T. Plass, V. Mueller, L. Reymond, I. R. Corrêa Jr, Z. Luo, C. Schultz, E. A. Lemke, P. Heppenstall, C. Eggeling, S. Manley & K. Johnsson; Nature Chemistry 5, 132–139, 2013. “Dynamic actin filaments control the mechanical behavior of the human red blood cell membrane”; D. S. Gokhin, R. B. Nowak, J. A. Khoory, A. de la Piedra, I. C. Ghiran and V. M. Fowler; Mol. Biol. Cell; February 25, 2015. “A cleavable cytolysin-neuropeptide Y bioconjugate enables specific drug delivery and demonstrates intracellular mode of action”; V. M. Ahrens, K. B. Kostelnik, R. Rennert, D. Böhme, S. Kalkhof, D. Kosel, L. Weber, M. von Bergen and A. G. Beck-Sickinger; J. Control. Release; 209:170-178, 2015. “Red Si–rhodamine drug conjugates enable imaging in GFP cells”; E. Kim, K. S. Yang, R. J. Giedt and R. Weissleder; Chem. Commun., 50, 4504-4507, 2014. “A marginal band of microtubules transports and organizes mitochondria in retinal bipolar synaptic terminals”; M. Graffe, D. Zenisek, and J. Taraska; J. Gen Physiol. Vol. 146 No.1: 109-117, 2015. “A Bright Dye for Live-Cell STED Microscopy”; S. Pitsch, I. Köster.